شمس اسفند آباد, بهمن, کابلی, محمد. (1397). توسعه شبکه مناطق حفاظتی با به کار‌گیری رویکرد برنامه‌ریزی سیستماتیک در ایران. فصلنامه محیط زیست جانوری, 10(4), 147-162. بهمن شمس اسفند آباد; محمد کابلی. "توسعه شبکه مناطق حفاظتی با به کار‌گیری رویکرد برنامه‌ریزی سیستماتیک در ایران". 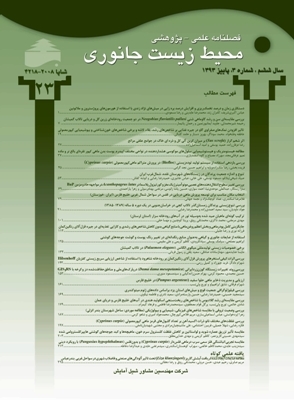 فصلنامه محیط زیست جانوری, 10, 4, 1397, 147-162. شمس اسفند آباد, بهمن, کابلی, محمد. (1397). 'توسعه شبکه مناطق حفاظتی با به کار‌گیری رویکرد برنامه‌ریزی سیستماتیک در ایران', فصلنامه محیط زیست جانوری, 10(4), pp. 147-162. شمس اسفند آباد, بهمن, کابلی, محمد. توسعه شبکه مناطق حفاظتی با به کار‌گیری رویکرد برنامه‌ریزی سیستماتیک در ایران. فصلنامه محیط زیست جانوری, 1397; 10(4): 147-162. با توجه به اهمیت حفاظت از تنوع‌ زیستی کشور، انتخاب مناطق حفاظتی صحیح کهمعرف خوبی از تنوع زیستگاه­ها و گونه‌های حیات‌وحش کشور باشند، امری ضروری است. لذا این مطالعه با هدف بررسی میزان کارایی شبکه فعلی مناطق تحت حفاظت سازمان حفاظت محیط زیست در حفاظت از تنوع زیستی کشور و معرفی مناطق جدید جهت افزایش کارآیی این شبکه با استفاده از رویکرد برنامه‌ریزی سیستماتیک به­انجام رسیده است. بدین منظور ۱۲۶ جانشین تنوع زیستی متشکل از ۲۰ گونه پستاندار،۲۰ گونه پرنده، ۵۳ گونه خزنده، ۱۰ گونه دوزیست، ۱۹ اکورژیون و ۴ منطقه با غنای بالای گونه‌های تک‌لپه ای اندمیک مورد استفاده قرار گرفته و میزان حفاظت از آن­ها بررسی شد. نتایج نشان می‌دهد که برای ۴۳ گونه از مهره‌داران، ۱۱ اکورژیون و نیمی از مناطق با غنای گونه‌ای بالای گیاهان تک‌لپه ای اندمیک کم­تر از ۱۰ درصد از مناطق واجد حفاظت، در درون شبکه مناطق حفاظتی موجود جای دارند. هم­چنین استفاده از نرم‌افزار برنامه‌ریزی سیستماتیک حفاظت Marxan به­منظور معرفی مناطق تکمیلی جدید به شبکه فعلی مناطق تحت حفاظت کشور نشان می‌دهد که باید حدود ۲۰ الی ۳۰ درصد از سطح کشور تحت حفاظت قرار گیرد. به علاوه، حدود ۱۵ درصد از سطح کشور در حفاظت از تنوع زیستی آن غیرقابل جایگزین هستند. لذا نتایج این مطالعه با معرفی مناطق تکمیلی برای شبکه مناطق حفاظتی کشور با رعایت موارد مهمی ازجمله حداقل وسعت (کم­ترین هزینه ممکن)، حداقل تعارض با جوامع انسانی و بیش­ترین کارآیی در حفاظت از تنوع زیستی می‌تواند مورد استفاده سازمان حفاظت محیط زیست ایران قرار گیرد. اسفنده، س.؛ کابلی، م. و اسلامی، ل.، 1396. استفاده از الگوریتم بهینه ­سازی مذاب­ سازی شبیه ­سازی شده برای اولویت­ بندی سیستماتیک مناطق حفاظت­ شده در استان البرز ایران. فصلنامه محیط زیست جانوری. سال 9، شماره ۱، صفحات 105 تا 122. جعفری، ع.؛ یاوری، ا.؛ بهرامی، ش. و یارعلی، ن.، ۱۳۸۹. انتخاب مناطق حفاظت ­شده جدید با تاکید بر تیپ­ های گیاهی و استفاده از C-Plan (مطالعه موردی: استان کهگیلویه و بویراحمد). مجله علوم محیطی. دوره ۳۶، شماره ۵۶، صفحات ۱ تا ۱۲. سلمان ­ماهینی،ع.؛ اسدالهی، ز.؛ صبایی، م.؛ کامیاب، ح. و نصیراحمدی،‌ک.، ۱۳۹۳. مقایسه روش­ های شبیه­ سازی تبرید تدریجی و اختصاص چند هدفه زمین در گزینش بهینه کاربری­ های اراضی. بوم ­شناسی کاربردری. سال 3، شماره 9، صفحات ۱ تا ۱۲. کابلی، م.؛ علی ­آبادیان، م.؛ توحیدی ­فر، م.؛ هاشمی، ع. و روزلار، ک.، 1391. اطلس پرندگان ایران. انتشارات سازمان حفاظت محیط زیست. کرمی، م.؛ قدیریان، ط. و فیض ­الهی، ک.، 1391. اطلس پستانداران ایران. انتشارات سازمان حفاظت محیط زیست. مجنونیان، ه.، 1393. مناطق حفاظت ­شده، مبانی و تدابیر حفاظت از پارک ­ها و مناطق در ایران و جهان. انتشارات نشر دی. ۴۱۴ صفحه. محرابیان، ا.، 1395. نقشه گیاهان تک ­لپه ­ای اندمیک ایران. دانشگاه شهید بهشتی. تهران. ایران. مظفری، ا.؛ کمالی، ک. و فهیمی، ه.، 1392. اطلس خزندگان ایران. انتشارات سازمان حفاظت محیط زیست. مهری، آ.؛ سلمان ­ماهینی، ع.؛ میرکریمی، ح. و رضایی، ح.، ۱۳۹۳. مقایسه کارایی سه الگوریتم هوشمند رایانه ­ای در انتخاب مناطق مناسب حفاظت (مطالعه موردی: استان مازندران). مجله محیط ­شناسی. دوره ۴۰، شماره ۱، صفحات ۱ تا ۱۶. ضیایی، ه.، 1387. راهنمای صحرایی پستانداران ایران. انتشارات مرکز حیات­وحش. یوسفی ­سیاه­ کلرودی، س.؛ سعیدی، ه.؛ بهفر، م.؛ فلاحی، ر. و ایزدیان. م.، 1392. اطلس دوزیستان ایران. انتشارات سازمان حفاظت محیط زیست. Ardron, J.A. ; Possingham, H.P. and Klein, C.J., 2008. Marxan good practices handbook. Pacific Marine Analysis and Research Association, Vancouver. Ball, I.R. and Possingham, H.P., 2000. Marxan version 1.8.3. Available at: http://www.ecology.uq. edu.au/marxan.htm. Ball, I.R. ; Possingham, H.P. and Watts, M.E., 2009. Marxan & relatives: Software for spatial conservation prioritization. In Moilanen A, Wilson KA & Possingham HP (eds.). Spatial Conservation Prioritization: Quantitative Methods and Computational Tools. Oxford: Oxford University Press. pp: 185-195. Bonn, A.; Rodrigues, A.S.L. and Gaston, J., 2002. Threatened and endemic species: are they good indicators of patterns of biodiversity on a national scale? Ecology Letters. Vol. 5, pp: 733-741. Carwardine, J.; Rochester, W.A. ; Richardson, K.S. ; Williams, K.J. ; Pressey, R.L. and Possingham, H.P., 2007. Conservation planning with irreplaceability: does the method matter? Biodiversity Conservation. Vol. 16, pp: 245-258. Ciarleglio, M.; Barnes, W. and Sarkar, S., 2009. ConsNet: New software for the selection of conservation area networks with spatial and multi criteria analyses. Ecography. Vol. 32, pp: 205-209. Delavenne, J.; Metcalfe, K.; Smith, R.J.; Vaz, S.; Martin, C.S. ; Dupuis, L.; Coppin, F. and Carpentier, A., 2011. Systematic conservation planning in the eastern English Channel: comparing the Marxan and Zonation decision support tools. ICES Journal of Marine Science. Vol. 69, No. 1, pp: 75-83. Esfandeh, S.; Kaboli, M. and Eslami, L., 2015. A chronological review on application of Marxan tool for systematic conservation planning in landscape. International Journal of Engineering and Applied Sciences (IJEAS). Vol. 2, No. 12: pp: 2439-3661. Farashi, A. and Shariati, M., 2017. Biodiversity hotspots and conservation gaps in Iran. Journal for Nature conservation. Vol. 39, pp: 37-57. Franklin, J., 2009. Mapping species distributions; spatial inference and prediction. Cambridge University Press. Game, E.T. and Grantham, H.S., 2008. Marxan User Manual: For Marxan version 1.8.10. University of Queensland, St. Lucia, Queensland, Australia, and PacificMarine Analysis and Research Association, Vancouver, British Columbia, Canada. Garson, J.; Aggarwal, A. and Sarkar, S., 2002. ResNet Manual, V.1.2. University of Texas at Austin, Biodiversity and Biocultural Conservation Laboratory. Hijmans, R.J.S.E. ; Cameron, J.L. ; Parra, P.G. and Jones, Jarvis, A., 2005. Very high resolution interpolated climate surfaces for global land areas. International Journal of Climatology. Vol. 25, pp:1965-1978. IUCN. 2003. Recommendations of the Vth IUCN World Parks Congress. World Parks Congress Durban 2003. Benefits Beyond Boundaries, Durban, South Africa, 8-17 September 2003. Available online at:http://cmsdata.iucn.org/downloads/recommendationen.pdf. Jimenez-Valverde, A. and Lobo, J.M., 2007.Threshold criteria for conversion of probability of species presence to either or presence absence. Acta Oecologica. Vol. 31, pp: 361-369. Lessmann, J.; Munoz, J. and Bonaccorso, E., 2014. Maximizing species conservation in continental Ecuador; a case of systematic conservation planning for biodiverse regions. Ecology and Evolution. doi: 10.1002/ece3.1102. Liu, C.; White, M. and Newell, G., 2009. Measuring the accuracy of species distribution models: a review. 18th World IMACS/MODSIM Congress, Carins, Australia. Margules, C.R. and Pressey, R.L., 2000. Systematic conservation planning. Nature. Vol. 405, pp:243-253. Margules, C.R. and Sarkar, S., 2007. Systematic Conservation Planning. Cambridge University Press, Cambridge. Moilanen, A.; Wilson, K.A. and Possingham, H.P., 2009. Spatial Conservation Prioritization: Quantitative Methods and Computational Tools. Oxford University Press, Oxford. 320 p.
Olson, D.M. ; Dinerstein, E. and Wikramanayake, E.D., 2001. Terrestrial ecoregions of the world; a new map of life on earth. BioScience. Vol. 51, No. 11, pp:933-938. Pawar, S.; Koo, M.S. ; Ahmed, M.F. ; Chaudhuri, S. and Sarkar, S., 2007. Conservation assessment and prioritization of areas in Northeast India: priorities for amphibians and reptiles. Biological Conservation. Vol. 136, pp:346-361. Phillips, S.J., Anderson, R.P., Schapire, R.E. 2006. Maximum entropy modeling of species geographic distributions. Ecological modelling. Vol. 190, No.3, pp: 231-259. Possingham, H.P. ; Ball, I.R. and Andelman, S., 2000. Mathematical methods for identifying representative reserve networks. In: Ferson S, Burgman M (Eds. ), Quantitative Methods for Conservation Biology. Springer-Verlag, New York, pp: 291-305. Possingham, H.P. ; Wilson, K.A. ; Andelman, S.J. and Vynne, C.H., 2006. Protected areas. Goals, limitations, and design. pp: 507-549 in M. J. Groom, G. K. Meffe, C. R. Carroll, eds. Principles of conservation biology. 3rd ed. Sinauer Associates, Inc. Sunderland, MA. Pressey, R.L., 1997. Priority conservation areas: towards an operational definition for regional assessments in: J.J. Pigram and Sundell RC, Editors, National Parks and Protected Areas: Selection, Delimitation, and Management, Centre for Water Policy Research, Armidale, New South Wales. pp: 337-357. Pressey, R.L., 1998. Algorithms, politics and timber: an example of the role of science in a public, political negotiation process over new conservation areas in production forests in: R.T. Wills and Hobbs RJ, Editors, Ecology for Everyone: Communicating Ecology to Scientists, the Public and the Politicians, Chipping Norton, Surrey Beatty and Sons, NSW. pp: 73-87. Pressey, R.L., 2009. The C-Plan conservation planning system: Origins, applications, and possible futures. In Moilanen A, Wilson KA & Possingham HP (eds.). Spatial Conservation Prioritization: Quantitative Methods and Computational Tools. Oxford: Oxford University Press. pp: 211-234. Rondinini, C.; Chiozza, F. and Boitani, L., 2006. High human density in the irreplaceable sites for African vertebrate conservation. Biological Conservation. Vol. 133, No. 3, pp: 358-363. Rodrigues, A.S.L. and Brooks, T.M., 2007. Shortcuts for biodiversity conservation planning: The effectiveness of surrogates. Annu. Rev. Ecol. Evol. Syst. Vol. 38, pp: 713-737. Rouget, M.; Cowling, R.M. ; Pressey, R.L. and Richardson, D.M., 2003. Identifying spatial components of ecological and evolutionary processes for regional conservation planning in the Cape Floristic Region, South Africa. Diversity and Distribution. Vol. 9, pp: 191-210. Sanderson, E.W. ; Jaiteh, M.; Levy, M.A. ; Redford, K.H. ; Wannebo, A.V. and Woolmer, G., 2002. The human footprint and the last of the wild. Bioscience. Vol. 52, pp: 891-904. Soule, M.E. and Sanjayan, M.A., 1998. Ecology conservation targets: Do they help? Science. Vol. 279, pp: 2060-2061. Stewart, R.R. and Possingham, H.P., 2005. Efficiency, costs and trade-offs in marine reserve system design. Environmental Modeling and Assessment. Vol. 10, pp: 203-213. Wiz, M.S. ; Hijmans, R.J.; Li, J.; Peterson, A.T.; Graham, C.H. and Guisan, A., 2008. Effects of sample size on the performance of species distribution models. NCEAS predicting species distribution working group, Diversity and Distribution. Vol. 14, pp: 763-773. Wu, R.; Long, Y.; Malanson, G.P. ; Garber, P.A. and Zhang, S., 2014. Optimized Spatial Priorities for Biodiversity Conservation in China: A Systematic Conservation Planning Perspective. PLoS ONE. Vol. 9, No. 7: e103783.